Don't start out by saying that coming in at 134 pounds was not a problem for you in this fight and then in the next breath say that if you ever fought Raheem at 130 pounds that things would turn out entirely different. 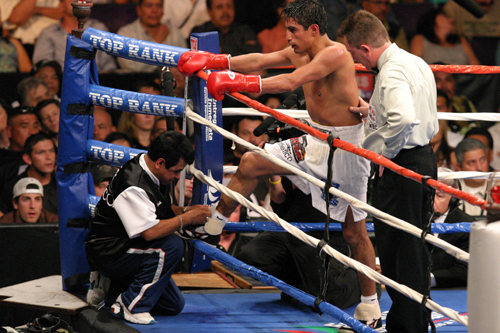 Erik Morales (48-3, 34 KO's) is a great Champion and will go down as a true legend, but on this night his lack of preparation got the best of him and deservedly so. But before I go ahead and write this one off to poor conditioning for Morales, let me say that Zahir Raheem (27-1, 16 KO's) is a consummate professional who came in prepared, had a game plan and stuck to it and was rewarded for his efforts with a clear cut unanimous decision. As soon as Morales shed the robe it was obvious that this was not the shape of the fighter who has done so much damage in the 130 pound weight class. 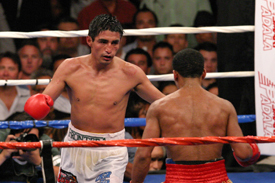 Fact is, Morales has not come in this heavy since a fight back in the year 2000. The outcome of that fight was a first round KO, but things were about to turn out a whole lot differently for Erik tonight. From the outset Morales just looked slower than Raheem and immediately started paying for it as Raheem scored easily and often with crisp punches while Morales was missing his mark and coming up short time and time again. 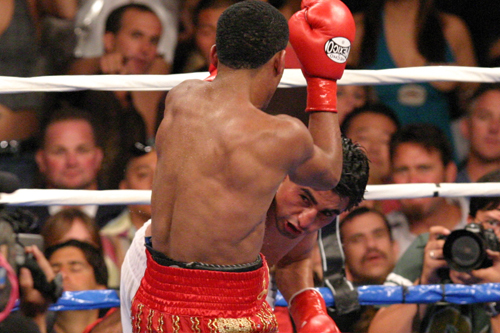 Throughout the early rounds Raheem was building up points and all that was building up for Morales was the welts on his often pounded face. Morales was showing all the signs of a fighter who was having one of "those" nights and his foe was looking confident and ready to go. 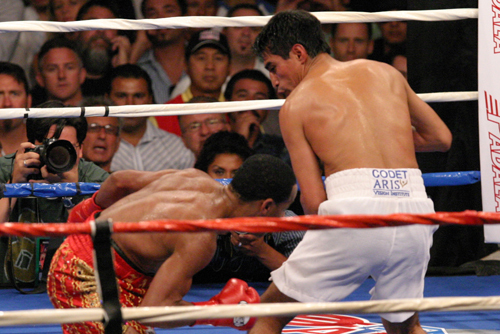 In the fourth round Morales caught Raheem with a sweet uppercut that landed flush, momentarily slowing the game fighter up. For a moment I thought that maybe that was what Morales needed and the tide was about to turn....I was greatly mistaken. 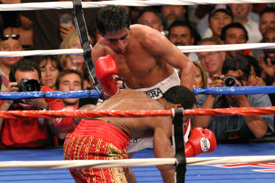 Raheem was focused and kept up the attack and whatever momentum might have been gained with that one uppercut was quickly lost before the end of the round and as Morales returned to his corner a look of complete frustration was heavy on his face. 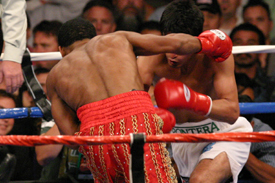 By round five Raheems punches were hurting Morales and the stunned crowd began to become nervous and loud. Surely they knew that their hero has been in this type of predicament before and found a way to fight out of it, and the cheers grew bigger and louder, "Mexico Mexico!" Morales did have his moments now and then in the middle rounds, but they were few and far between, all the while Raheem continued his game plan of sticking and moving, and it was working. In utter disdain for his challengers tactics, Morales spent most of round 11 with his left hand dangling at his side, daring Raheem to come in and fight, that if he did' Morales could beat him with one hand. Morales even managed to land a few good right hands during this display of Machismo but it was becoming way too little, and way too late. Morales lost round 12 on all three judges scorecards and in doing so he showed that he just didn't have enough to pull out all the stops and land that one big bomb which would have been the only way he could have won this one. Scores were all in Raheem's favor, 118-110, 116-112, and 115-113, I had it for Raheem 117-112, for whatever that's worth. 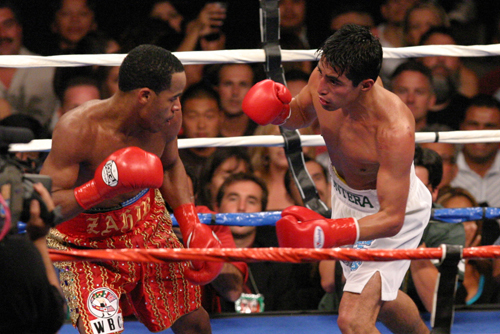 So now Zahir Raheem holds the WBC International Title and Erik Morales will still get that much ballyhooed rematch with Manny Pacquiao. 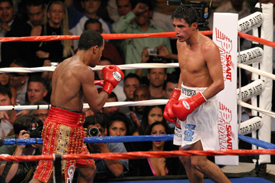 I'm venturing to guess that Morales comes in at 130 fit and ready pounds for that diddy!